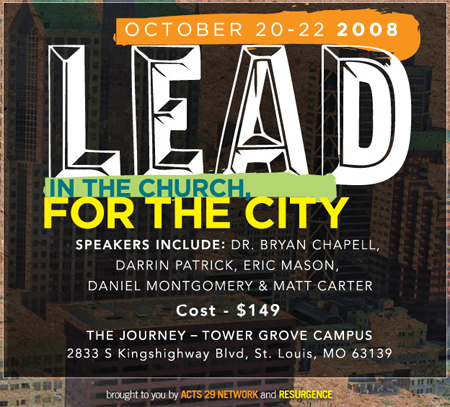 Alas… I got fired up reading about the Lead for the City conference over at Acts 29’s blog and I wanted to post the words/questions that got me fired up here. So here you go! Doing ministry in the new global cities is not an easy task. Sure, rural and suburban areas present their own unique challenges, but often it’s the city leader who feels alone in the most influential centers of our world. You are called to stay: to reach non-traditional people and to connect with the new artistic and economic elite, most of whom care nothing for the church. You are faced with corruption in the local political system; you see decay around you every day. In the middle of this, you are called to actually make a dent for good in the larger social fabric… certainly no easy feat. What does it mean to love your city? What does it mean to “reach” your city in truly transformational ways? If you’re a minority leader, how do you navigate between the two worlds of your local tribe and the larger evangelical culture that you often feel torn between? How do you find resources – the leaders and money – to do what needs to be done? How can you plant a new church in an area where a church a day either dies because of its refusal to adapt or sells out in the name of relevancy? How do you preach truth in a culture that is increasingly resistant to it? How can you work for Shalom in a place rife with racial and socioeconomic division?